I really like this sink. I would recommend anyone looking for a stainless steel farm sink to consider this one. Dimensions 29.75 In. X 20.75 In. X 10.0 In. 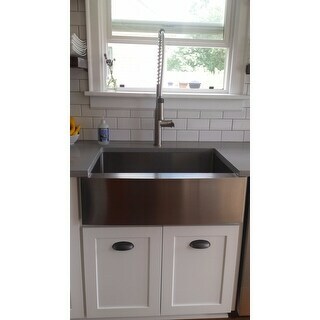 Love this stainless apron sink with bottom rack. I'm ordering a second one for a house flip and another Kraus Nola Single Lever Commercial Style Kitchen Faucet. It looks bomb together! Tons of compliments from guests. The sink was absolutely great, just what we wanted. Unfortunately the base cabinet that we had for it was not the right size for the sink. I am writing this review just to say how great Overstock was about returning it. I chatted with a person on line, got a shipping label, packed it up and dropped it off at UPS. They were very nice and it was easy. I will definitely shop at Overstock again because of this experience. I like everything about this sink. It’s large and looks great in my kitchen. The price was also a big factor. I had gone to several stores here in my area and online and I couldn’t beat the price on this sink. Great purchase! The title says it all -- we have had this for 6 weeks and find it to be both beautiful and sturdy. You do have to wipe water off the flat part in the front to prevent spotting (although a steel cleaner will take it off right away). Durable and well made. Love the sound proofing detail as well. Deep sink. Plenty of room for pot and pan clean up. Fell in love with the look of this sink. Found it from other brands for more than double the price. This actually ended up being a thicker steel than those higher priced sinks and it included the grate! Kraus has an excellent reputation so it was a no brainer. Received it within a week and it was so well packaged. Thrilled for it! Can’t wait to install with our kitchen renovation. Will update once it’s in. Very durable sink. Looks awesome and has held up very well. Very easy to clean and maintain. Comes with a nice rack that keeps dishes and what not off the bottom of the sink. I am renovating my kitchen and it was important to find a farmhouse sink that would fit into my new base cabinet. I ordered this sink and it arrived within 5 business days. I cannot get over how beautiful and well made it is. We had a little trouble installing it over the base cabinet and had to partially cut into the sides of cabinet to make it fit properly, but otherwise it looks beautiful. Love this sink, not only does it look great it's also a better quality than the one we were looking at in the big box home improvement store and a much better price. I love that it comes with a strainer which will help protect the surface. This sink looks nice, but gets dull very quickly. I am constantly polishing it with stainless steel cleaner. It also scratches very easy. It was nice, and cheaper than my local store. The salesman at the local store recommended overstock, he said get it there it’s cheaper there. Great sink and our contractor had no problems installing it. Love the huge space big enough to wash large pots and pans! However, I took out the rack insert as it was a pain to clean, especially on the underside and replaced it with a silicone sink mat. Sink exactly as pictured. Was very easy to install and looks very sleek and expensive. We paired it with the matching faucet and have gotten lots of compliments. "Does this sink fit into a 30 inch cabinet? 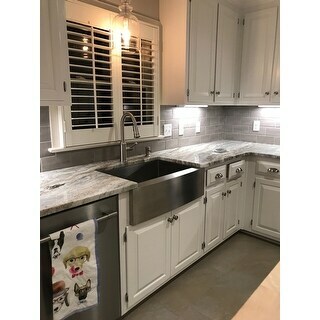 Or do we need a larger cabinet to accommodate this sink? We have no room to spare beyond 30 inches. TIA"
Hello, Thank you for your inquiry. Please be advised this model is a custom installation and requires an internal (inside) cabinet dimension of 29.75" for the model to work. For example if you overall cabinet is 30 inches more than likely your internal (inside) is smaller and might not be able to accommodate this model. "Is it true that one cannot use this sink if also having laminate countertops? If so, what material should be used, only Silestone type product or granite/quartz?" I have quartz and it works perfectly. "Does it say anywhere whether or not this sink is coated? I have some scratches on mine and the scratch removal kit says to only use on non coated stainless." "is the stainless smudge proff? does it show fingerprints?" Does not show fingerprints - beautiful sink - love it! It is not smudge proof....& it can show fingerprints however the microfiber cloth that’s sent with the sink works great! It is a lovely sink! Very deep! It does show fingerprints, but I treated it with a stainless steel cleaner and it now resists prints. It's a wonderful sink! "Does this come with a faucet? When I select sink/faucet combo this is the first thing listed." No, Kraus just sells faucets, too. I got this sink and the Kraus Nola Concealed Pull Down faucet. Great pair. "Can you install a garbage disposal beneath the drain of this sink?" Yes, if you are using a standard height cabinet there is plenty of room. "How many inches is the apron?" Ada O. If you mean the front of the sink.. The width is 49.75 and depth us 9inches. I installed mine in a 30inch cabinet as an undermount.